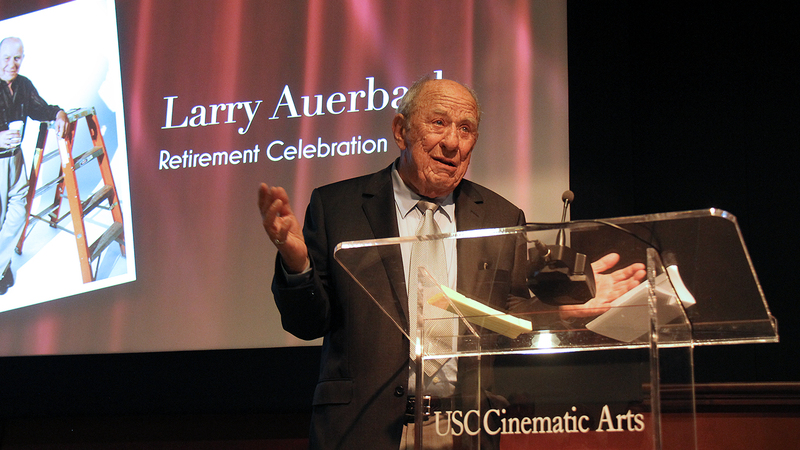 An era at the USC School of Cinematic Arts came to an end on April 12th as Associate Dean of Industry Relations Larry Auerbach celebrated his retirement after twenty-five years at the School. His retirement was celebrated in the SCA Gallery in the Steven Spielberg Building and was attended by Dean Elizabeth M. Daley, professor David Weitzner, television agent Alan Berger, alum/producer Jason Berman, alum/studio executive Bob Osher, alum/producer Aaron Kaplan, a video message from head of CAA Bryan Lourd, Larry’s family, students, faculty, staff, and alumni of the School of Cinematic Arts. Nearly every Trojan who walked through the halls of SCA has been helped by Auerbach at some point during his or her time as a student. Between managing his office, leading talks with titans of the industry, and having impromptu meetings with students, Larry Auerbach was the bridge between young Trojans and the film and television industry. His dedication, knowledge, and no-nonsense mentorship launched countless careers and, along with his staff in Industry Relations, changed the face of film, television, and interactive media. The evening was emceed by Bonnie Chi, the Director of Industry Relations and a long time collaborator of Auerbach. She called his longtime friend and director of the USC Summer Program David Weitzner to speak first. Weitzner told several stories of their time together in the film trenches of New York before coming to Los Angeles. The next speaker was CAA agent Alan Berger who had worked with Larry at the William Morris Agency. Berger spoke emotionally about Larry setting an example of how to conduct himself as a businessman. Producer and lecturer at SCA Jason Berman described himself as “too eager” as an undergraduate when he first encountered Larry as a mentor. He talked about his transition from being a producer to being a teacher in Larry’s Business of Cinematic Arts program and the example he gives with his generosity. Head of the Alumni Development Council and studio executive Robert Osher gave a history of Larry’s move from New York to Los Angeles and how he treated the students at SCA with the respect and care with which he treated his clients as an agent. Television producer Aaron Kaplan roasted Larry about his age and temperament but ended on a sweet note about his practical advice when Kaplan was transitioning from being an agent to being a producer. As Associate Dean of Student Industry Relations at the USC School of Cinematic Arts, Larry Auerbach met one-on-one with students looking to forge their careers in the entertainment industry. 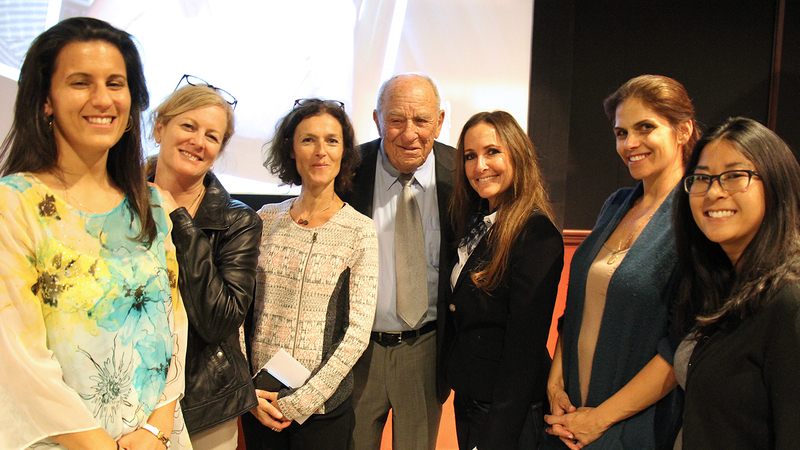 These visits were a rite of passage for aspiring writers, directors, animators, studio executives, and agents at USC. With over 50 years working in the business, Auerbach offered the next generation a wealth of knowledge, heart, and candor they couldn't find anywhere else. In 1992, Auerbach joined the USC School of Cinematic Arts as the Executive Director and Associate Dean of Student Industry Relations. Before coming to the School, Larry had a long career at the William Morris Agency, where he served as Executive Vice President and a member of the Board of Directors. In the course of his 47-year career there, Auerbach distinguished himself in virtually every facet of the entertainment industry. He began in television during its formative years, booking clients for guest spots – including Elvis Presley – before launching the agency’s rock music department, where he represented such leading artists as Sam Cooke, Jackie Wilson and Aretha Franklin. As the head of the agency’s New York motion picture division, Auerbach represented acclaimed filmmakers such as Bernardo Bertolucci and Norman Jewison, and was involved in negotiations that produced 25 motion pictures, including Last Tango in Paris and Oscar winner The French Connection. In addition, Auerbach served as head of the television department in Los Angeles, negotiating multiple deals for Aaron Spelling and Alan Alda in M*A*S*H.
Larry will be transitioning to an advisory role at USC.